KE00073 is a solid phase sandwich Enzyme Linked-Immuno-Sorbent Assay (Sandwich ELISA). 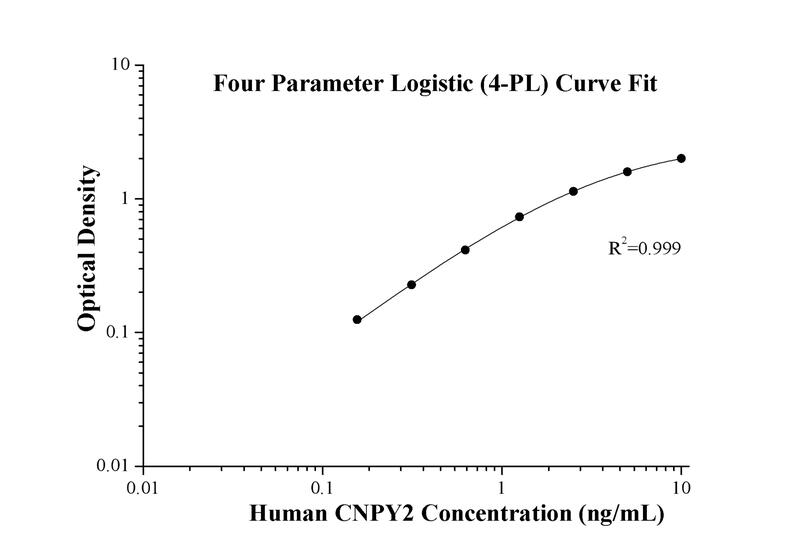 The CNPY2 ELISA kit is to be used to detect and quantify protein levels of endogenous CNPY2. The assay recognizes human CNPY2. A polyclonal antibody specific for CNPY2 has been pre-coated onto the microwells. The CNPY2 protein in samples is captured by the coated antibody after incubation. Following extensive washing, a monoclonal antibody specific for CNPY2 is added to detect the captured CNPY2 protein. For signal development, horseradish peroxidase (HRP)-conjugated antibody is added, followed by Tetramethyl-benzidine (TMB) reagent. Solution containing sulfuric acid is used to stop color development and the color intensity which is proportional to the quantity of bound protein is measurable at 450nm with the correction wavelength set at 630 nm. CNPY2, also named as MSAP, TMEM4 and ZSIG9, is a positive regulator of neurite outgrowth (PMID: 12826659). It interacts with the ezrin-radixin-moesin (ERM)-like myosin regulatory light chain-interacting protein (MIR), and the two proteins are co-localized in cell lines and in primary neurons. CNPY2 is a HIF-1α regulated, secreted angiogenic growth factor that promotes smooth muscle cells migration, proliferation and tissue revascularization (PMID: 25589425). CNPY2 enhances cell spreading in fibroblasts and migration of rat C6 glioma cells (PMID: 15905959). CNPY2 was also shown to influence the expression of low-density lipoprotein receptor and FGF21 (PMID: 22378787). This kit is used to quantify CNPY2 level in vivo.